Approximately a month ago, the United States government shut down for the second time since Donald Trump became President. However, unlike the previous shutdown under the same administration, it was not resolved in a few days. Rather, at 33 days and counting, this shutdown is officially the longest in American history (the previous record being the 21 day shutdown during the Clinton administration). While negotiations have not yet led to a compromise, the end of this shutdown may be imminent. A government shutdown happens when Congress does not approve a budget for the upcoming fiscal year before the deadline, which in this case was December 21st, 2018. In order to avoid a shutdown, the Senate unanimously passed a spending bill, that also needed to be passed by the House of Representatives and be signed by President Trump. At the time, the House was still majority Republican, as new Congress members had not yet been sworn in. Some Democratic Senators were signing Christmas carols during the vote, demonstrating how confident they were that the shutdown had been avoided with this spending bill. However, before the bill was voted on in the House, President Trump signaled that he would refuse to sign any deal that did not include money for a border wall. Therefore, instead of voting on the Senate-approved spending bill, the House of Representatives voted to approve another spending bill, which included funds for the wall. This new spending bill failed to pass in the Senate, resulting in a partial government shutdown. 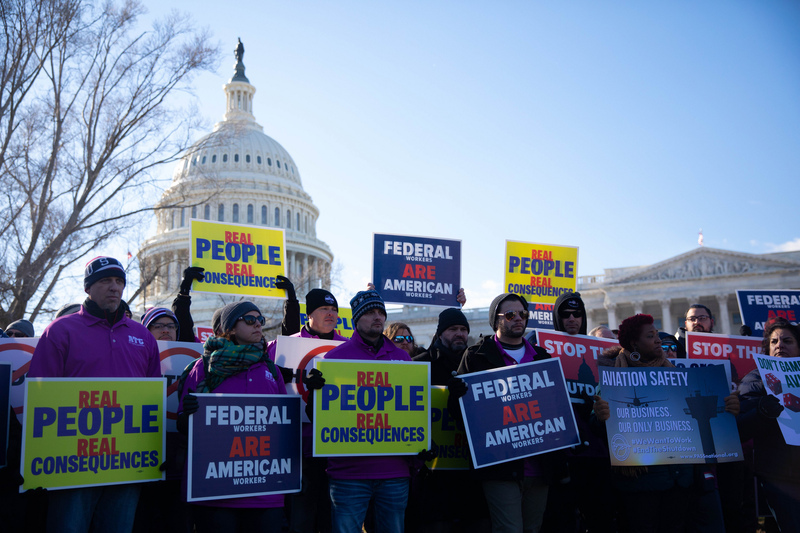 800,000 federal workers from nine different agencies have been affected by the shutdown. Some workers, like TSA agents, are deemed “essential”, and have to go to work without pay. Others are furloughed, meaning that they have been put on a temporary leave of absence. This lack of paycheck has created anxiety for federal workers, who are struggling to pay rent and feed their families. Many have come forward to help the workers affected, including Jose Andres’ World Central Kitchen, a temporary kitchen to feed federal workers and their families for free in Washington D.C. The shutdown has also impacted the lives of everyday Americans who do not work for the federal government. The Internal Revenue Service (IRS) has stopped most of its services, immigration courts have stopped hearing cases, and national parks have either closed or limited services. Furthermore, checkpoints at certain airports are closed, since many TSA agents have called in sick rather than come to work without pay. The Food and Drug Administration (FDA) had also stopped inspecting food, until they resumed with a limited inspection on January 15th. There is also fear that air travel is more dangerous during the shutdown. Since federal aviation inspectors have not been deemed necessary workers, they have not been working, meaning that planes are not inspected before flights. On January 3rd, the new Congress was inaugurated. This means that, for Congress to reopen, a spending bill will need to be approved by a House with a Democratic majority, which was not the case during the previous shutdown. This is a major roadblock preventing the shutdown from ending. Speaker Nancy Pelosi has made it clear that she will not have a vote on legislation that includes a border wall, while President Trump argued for the importance of the wall during a televised address to the nation in early January. The House of Representatives has already voted on multiple spending bills that would reopen the government, and then allow for a debate on border security. However, Senate Majority Leader Mitch McConnell has refused to bring any legislation to the floor of the Senate without President Trump’s approval. Thus, the House’s efforts to end the shutdown have so far been in vain. Despite Pelosi’s failure to reopen the government, her favourability rating has gone up since the start of the shutdown, indicating that the majority of Americans do not blame her for the situation. Despite Trump’s failure to propose a compromise that would be acceptable for the Democrats, the end of the shutdown might be near. McConnell, who has spent most of the shutdown refusing to hold votes on the Senate floor, has announced that there will be two votes in the Senate on Thursday, January 24th. The first vote will be on Trump’s proposal, but it is likely to fail. For such a bill to pass, it would need support of all 53 Republicans and seven Democrats, which is very unlikely to happen. Furthermore, even if this vote did pass the Senate, it would not pass the House. The second vote will be on legislation that the House of Representatives has already passed, and does not include funding for the wall. Instead, the bill is a temporary solution that will fund the government until February 6th. While it is an uphill battle, this bill has better chances of passing than Trump’s proposal. It would need the support of all 47 Democrats and 13 Republicans, which is also unlikely. However, some Republicans are growing impatient with Trump and McConnell. For example, Susan Collins (R-Maine) and Cory Gardner (R-Colorado), who are both up for reelection in 2020, have stated they support reopening the government without a deal for the wall. At this point, the dynamics of the shutdown are pretty clear. The House of Representatives will only pass spending bills that do not include funding for the wall. President Trump will not sign anything that does not include money for the wall. Senate Democrats will also not vote for any legislation with wall funding. Ultimately, the end of the shutdown lies with Senate Republicans, especially the moderate ones. Moderate Republicans facing an uphill reelection battle in 2020, such as example Collins, Gardner, Tom Tillis (R-NC) and Joni Ernst (R-IA), might be tempted to vote to end the shutdown, rather than face the anger of voters next year and risk losing their seat. According to a recent poll, only 32% of Americans believe the shutdown should be blamed on Democrats. This means nearly 7 out of 10 Americans blame the shutdown on either Trump or Republicans in Congress. These are not good numbers for Senate Republicans. Since they do not want to lose their majority in 2020, they will need to make a decision soon. They can continue to vote for bills with wall-funding, even they will never be voted on in the House. Or, they can decide to break with the President, and vote to reopen the government. Given that all 100 Senators had already voted on legislation to keep the government open without wall funding, it is not an absurd idea. Thursday will tell which path Republicans have decided to choose. Featured image by Senate Democrats, via Flickr Creative Commons.